A Girl Called Erika: Let's Get Organized! I am in an organizational mood. All week at work, I worked really hard to clear my desk of the many ridiculous files that had piled up there. I made some real progress, and I can actually see my desk now! It's basically a miracle. I know, I know. I shouldn't get all excited about this, because someone will just dump more files on my desk any day now, but I feel proud of this accomplishment. When I got home today, I decided that I needed to make use of the two baskets I purchased at Michael's a couple of weeks ago when they were having a big storage sale. I always knew they were destined for the mud room shelves, I just wasn't sure how I would arrange things. I wish I had taken a before picture. It wasn't bad, but it was too cluttered. Not that I'm a super tidy individual, of course, but I am trying to move the house toward organized as best I can. So, let me tell you what the shelves were holding before my whirlwind of organization took over. Half of the top shelf was covered in water bottles and travel mugs. Too many, and we never, ever use them. For now, they will hang out in the attic until I can decide what to do with them. Also on the top shelf was Boyfriend's lunch box, a vinyl tablecloth for our picnic table and some hats. The bottom shelf was home to a huge grey container of grilling implements as well as a basket containing an assortment of weird items, batteries and a couple of my aprons. 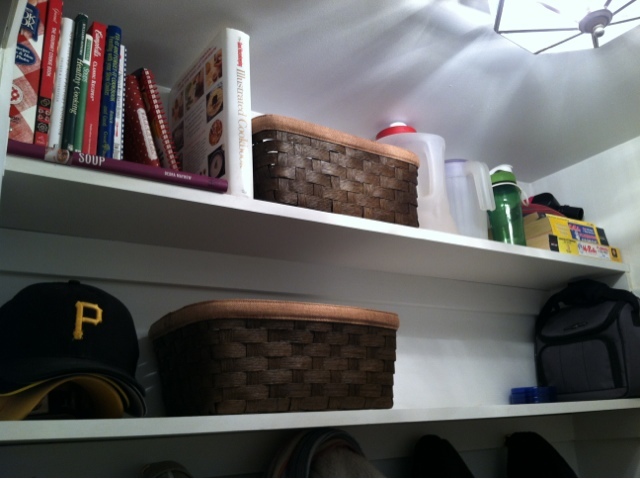 You'll notice that Boyfriend's hats are stacked neatly on the bottom shelf. I don't know how long this will last, but he did pledge to do his best to keep them organized. In the basket next to the hats are some winter hats and gloves. Then there is a set of coasters (back up coasters, you see) and Boyfriend's lunchbox. 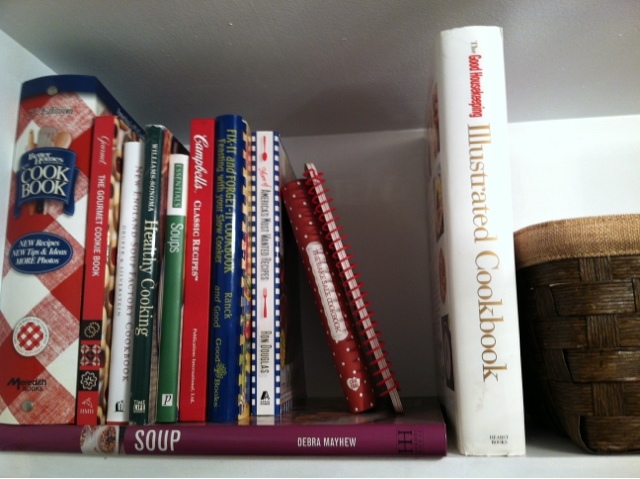 On the top shelf, I created a space for all of my cookbooks to live. Together!!! Until tonight, some were in the dining room and some were in the bedroom. I'm pretty excited. The basket next to those contains that vinyl tablecloth and some aprons. And then there are the plastic pitchers, a couple of water bottles and the phone books. Above is a better picture of my cookbook collection. Some were Boyfriend's when we met, some were mine, blah, blah. I realized later that the Joy the Baker cookbook is on the end table in the living room. I like it there because it is pretty. Maybe it will migrate to the cookbook area eventually. I'm really excited that the cookbooks are all in one place. I wish I had a shelf in the actual kitchen, but since this is attached to the kitchen, it's close enough. And when I moved books on the shelf in the dining room, I was able to put all of my sewing books together (with my Young House Love book, of course). THINGS MAKE SENSE NOW!!!!!!!! I'll probably throw my Square Foot Gardening book in there with the sewing and home-related books someday. It, too, lives on the end table. Since this is a three day weekend for me, I am hopeful that my productivity will continue. I want to tackle the attic a bit: go through stuff, reorganize, vacuum, etc. Boyfriend has plans to organize all of the manuals we have lying around for our appliances and other gadgets. It will be so fabulous. I'm also planning to work on some sewing project or another. We'll see what I can get into. What are you doing this weekend? Do you have Monday off like I do?